The region-wide blackout last night brought back so many childhood memories! I was one of those kids who complied easily at bedtime because I always had my pink Ever-Ready flashlight stashed under my pillow. So I didn’t let the power outage interfere with my daughter’s storytime and it was actually so fun that I think we’ll have do this again every once in a while! 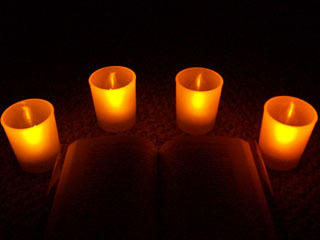 I have to admit, I’ve never read by candlelight. 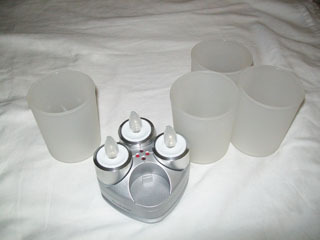 A few years ago my mom gave me these clever, rechargeable tealights that are constantly repositioned around my house. I just love them. They give off a flickery, orange glow that’s quite similar to real fire—a nice alternative when you want to go all Smokey the Bear /Don’t Play with Matches on your kid. (Of course my daughter has seen me dangle satin ribbons in candle flames when I’m crafting, so I’m probably confusing her with my mixed messages). The tealights do not offer good reading light, but Halloween is coming and they create a perfectly creepy effect, don’t you think? 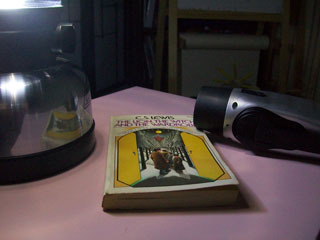 And I do have a booklight which my husband gave me in hopes I’d use it instead of my bedside lamp when I’m reading at night. But I don’t really like it. 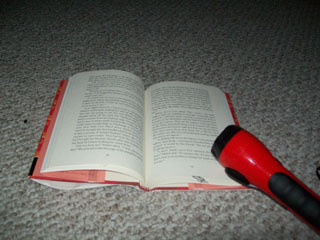 Now, does reading in dim light really hurt your eyes? According to this article, not necessarily, though eye strain–as most avid readers already know–is hardly desirable. Wherever and whenever you’re reading, be kind to your eyes!